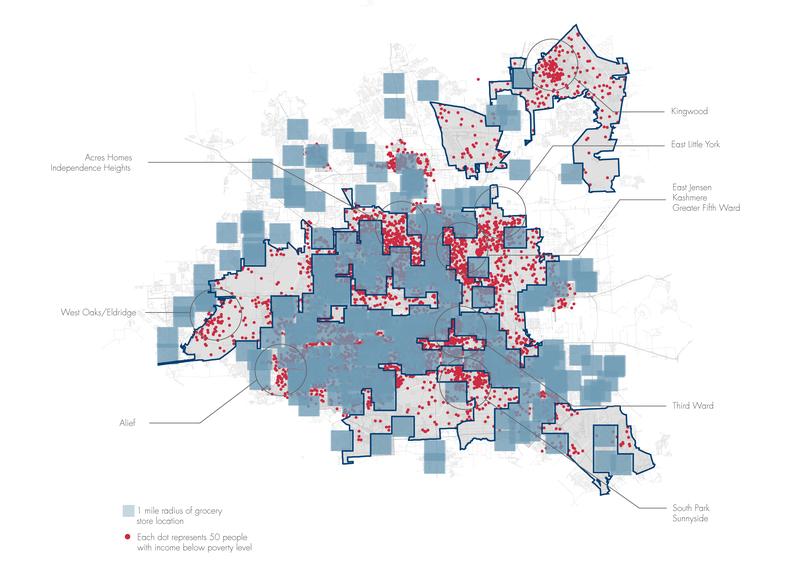 Houston Gardens and its surrounding neighborhoods such as Settegast and Kashmere Gardens are widely considered to be food deserts, areas in which it's difficult to purchase fresh, healthy foods—especially without a car. 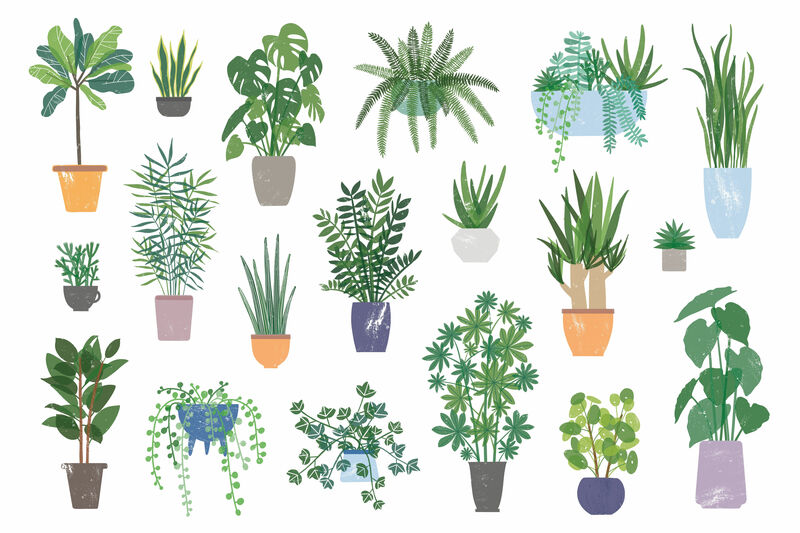 Initiatives like Planted Houston—which plans to establish urban gardens in these areas—and Last Organic Outpost, which runs the Emile Street commnunity gardens in the Fifth Ward, aim to help combat food deserts, as do organizations like Can Do Houston. But just because an area is deficient in grocery stores doesn't mean it's entirely deficient in good food. In Houston Gardens, restaurants like Carrol's Diner and JW's Original Cajun Boudin Hut have been thriving for years. 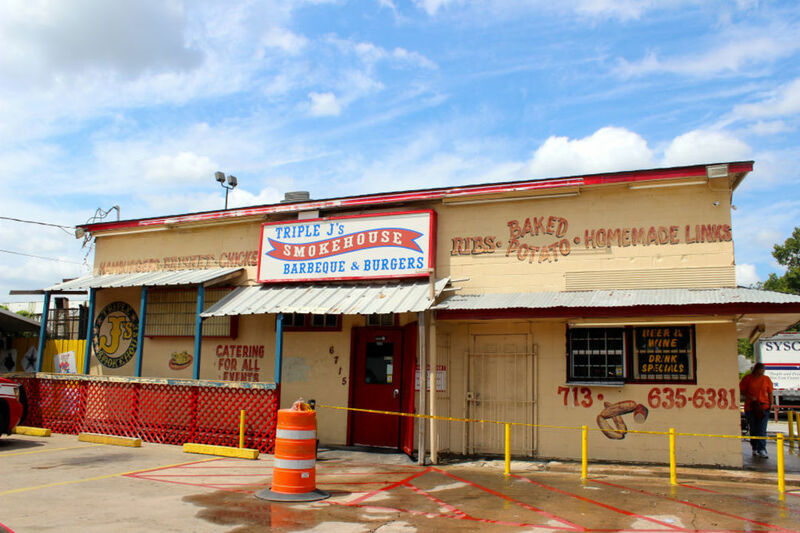 Perhaps the most popular joint in the entire area, however, is Triple J's Smokehouse, which many midway fans will recognize as a longtime vendor at the annual Houston Livestock Show and Rodeo. 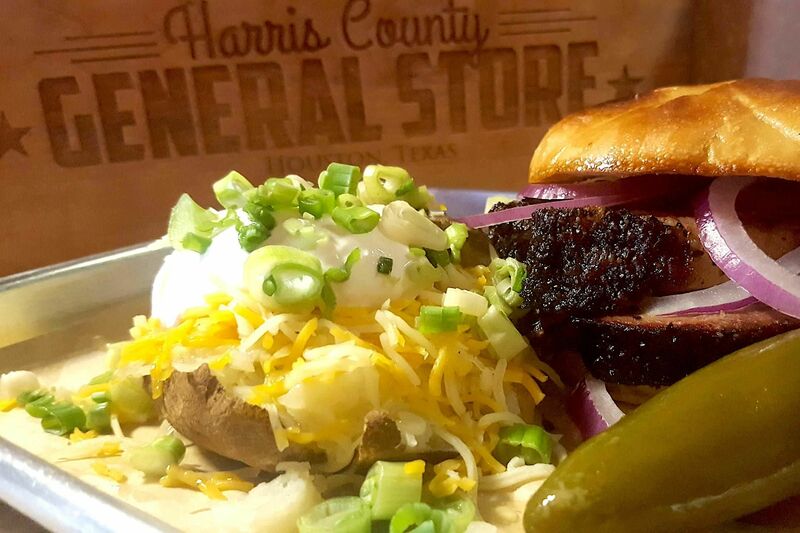 In fact, Triple J's took home a first place blue ribbon in last year's Gold Buckle Foodie Awards at RodeoHouston for its massive baked potato stuffed with chopped beef, sausage, and ribs. While you can't quite get that identical meal at Triple J's bricks-and-mortar location on Homestead Rd., you can load up on its three best-selling meats and two sides with the Triple J plate for $13. 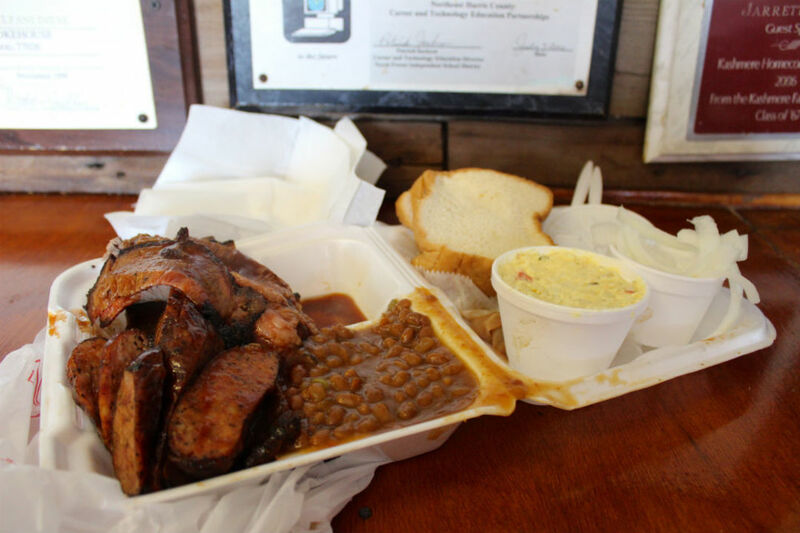 A Styrofoam container comes piled high with brisket, two massive pork ribs, and slices of smoked sausage. Of the sides, I'd recommend the potato salad with a tart, mustardy pucker and the sweet baked beans hopped up with lots of chopped green onions—both are among the best sides I've ever had at a barbecue restaurant. 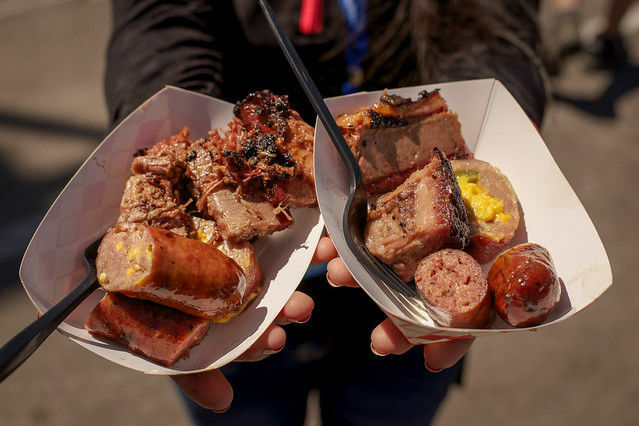 There's so much barbecue contained in one plate, it's easy to see why Triple J's is often asked to cater meals for the Houston Texans; this is hearty eating. In fact, owner Jarrett Scales used to be a football player himself. Having grown up nearby—attending Kashmere High School in the 1980s—Scales was recruited out of high school to play football for Purdue University. After graduating, Scales moved back home to open a restaurant in his old neighborhood with wife Rhonda, and Triple J's Smokehouse was born in 1994. Years of memorabilia cling to the walls in the one, tiny dining room with a communal-style picnic table: Blue Ribbon awards from Marvin Zindler, photos of various Little League teams Scales has sponsored, Texans pennants, and two decades of greeting cards from fans. Today, Scales and his crew use post oak to smoke their brisket, ribs, chicken, and sausage—all of which goes quickly when the place opens for lunch each day at 11 a.m. The lines are usually long, but afford you ample time to make a selection as you watch the pit crew haul in bark-covered briskets jiggling with soft, rendered fat or smoked chickens with their crackly skin nearly blackened. 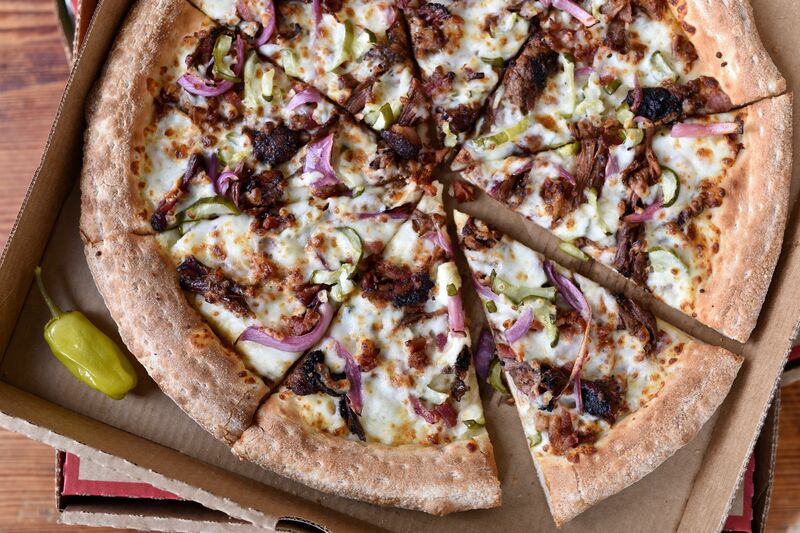 If you weren't starving when you walked in, you will be by the time you reach the register. This is normally where I'd tell you to leave room for dessert—a choice between homemade peach cobbler and Italian cream cake—but I've never gotten that far at Triple J's. Here, meat is my dessert...and very often my breakfast and lunch the next day.